A visit to Yellowstone National Park is all about the awe. The first national park in America, Yellowstone covers nearly 3,500 acres nestled atop a volcanic “hot spot,” which creates a variety of unique, must-see geothermal attractions. Filled with craggy mountains, lush valleys, winding canyons, and an eclectic collection of mountain rivers, Yellowstone offers an abundance of natural beauty vying for your attention. And the park’s waterfalls are no exception. Some of the falls are readily visible from a casual drive while others require a bit of a hike (the payoff is always worth it). 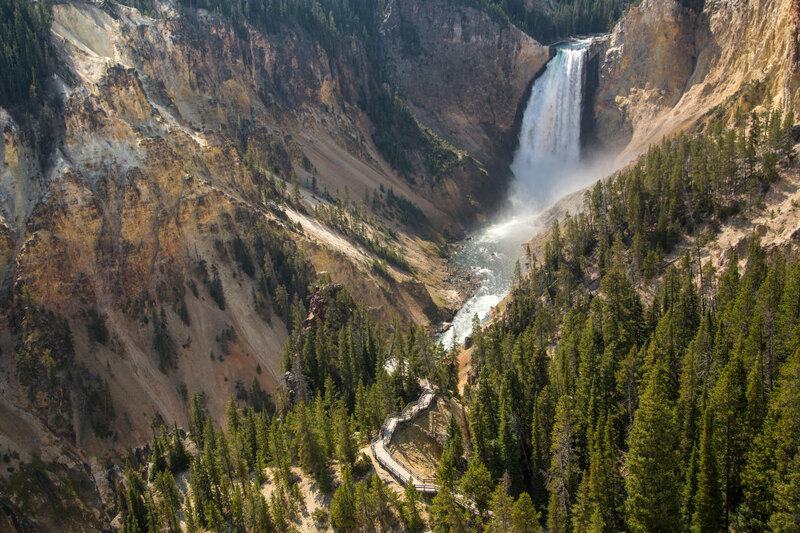 Traveling to Yellowstone from Vancouver, Ping Shen took the short hike on the Brink of the Upper Falls Trail, giving her and her husband a spectacular view of one of the the park’s signature waterfalls. “My standards for waterfalls are rather high,” she says, mentioning that she’s also visited Yosemite and Niagara Falls, and viewing the Upper and Lower Falls of the Yellowstone River was a definite highlight of trip—as was the surrounding wildlife that she saw throughout the park. 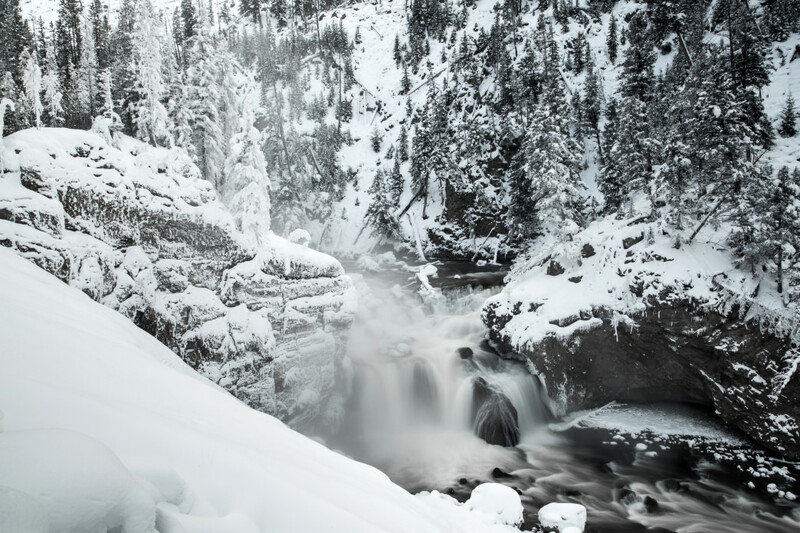 Firehole Falls is a sight to see no matter the season. Located less than 30 minutes from the town of West Yellowstone, Firehole Falls is one of the most accessible—and stunning—waterfalls in the park. 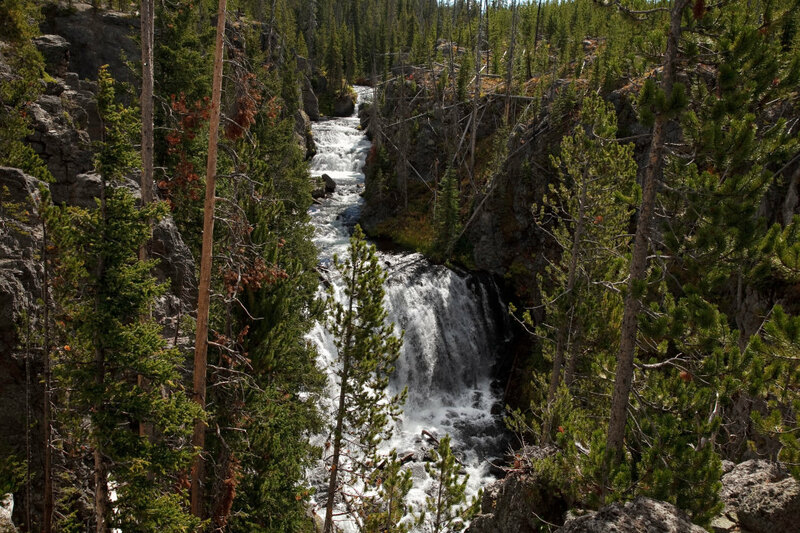 You’ll find the falls just off a gorgeous scenic drive through Firehole Canyon, and you can watch as the Firehole River meanders along the rocky cliffs before plunging 40 feet down. The Firehole Canyon Scenic Drive features a small parking area (plan to arrive early as the lot fills quickly in the busy summer months). The drive alone is worth the journey, but do plan to get out of your car and watch the majesty of the falls, one of the park’s classic sights. Tower Fall plunges 132 feet into the famed Yellowstone River. One of the more famous waterfalls in Yellowstone National Park, Tower Fall is located roadside between Tower-Roosevelt and Canyon Village (just three miles south of the Roosevelt Junction). It is easily accessible thanks to a roomy parking area just a 300-foot stroll to the viewing area. Tower Fall was named in 1870 for the stunning, rocky pinnacles that frame the falls. Visitors can watch as Tower Creek drops a dramatic 132 feet straight down before joining the famed Yellowstone River roughly 1,000 yards downstream. This can be one of the busier falls in the park, so plan ahead and arrive early for the most peaceful experience. 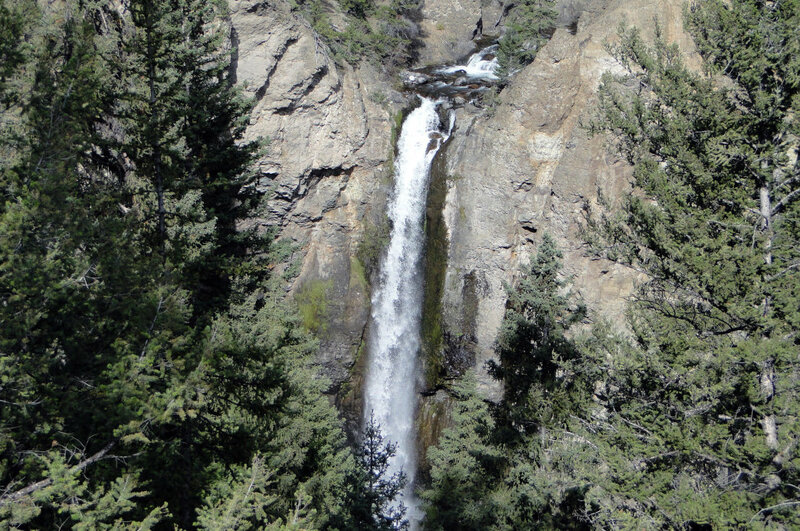 Gibbon Falls is nestled in a quintessential Yellowstone environment of rocky cliffs and scrubby pines. 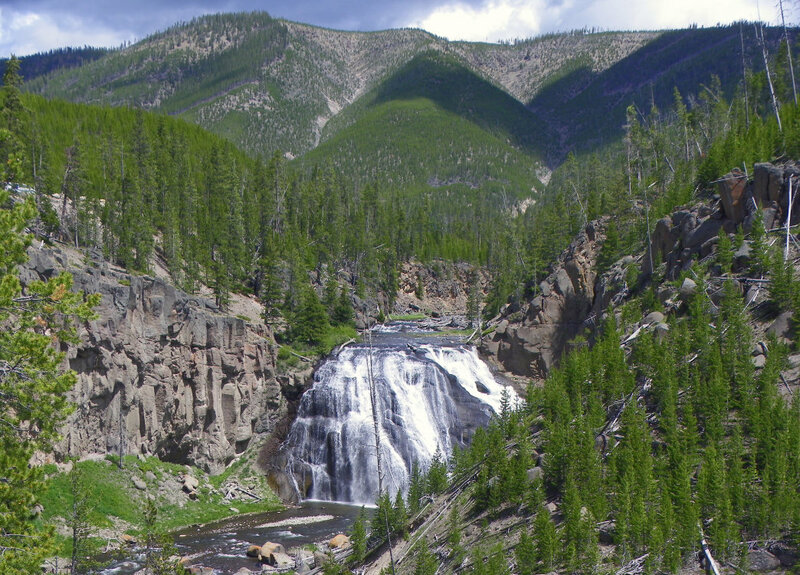 Located just off the road between Madison and Norris Junctions, stunning Gibbon Falls is an easy drive from the park’s entrance at West Yellowstone. If you’re lucky, you may be able to glimpse (and hear) the falls from your vehicle. But do yourself a favor and park. It only takes a few steps into the woods to reveal the full beauty of the falls, which cascade 84 feet into a small, clear pool. The setting is quintessential Yellowstone, with scrubby pine trees and rocky cliffs. If you’re looking for a break from the busier scenic overlooks, Kepler Cascades is a great option. Drive just south of Old Faithful for a glimpse of Kepler Cascades, where the Firehole River narrows and dramatically drops into a rocky pool. Park your car and take a short stroll down a well-marked pathway that leads to a dramatic overlook high above the 150-foot waterfall. The overview is small and feels snug nestled among the pines. If you’re looking for a break from the busier scenic overlooks, Kepler can offer a moment of peace in the woods. Undine is perfect for those seeking a little solitude. Undine Falls takes its name from wise, typically female sprites who reside near waterfalls in mythology. It’s quite easy to imagine mystical fairies living amidst this triple-plunge waterfall. Undine Falls drops 60 feet into a stark canyon below, set amidst the Park’s classically rock-lined landscape and many downed trees from years past. One of the lesser-trafficked falls in Yellowstone, Undine is perfect for those seeking a little solitude. The falls are easily accessed off the highway between Mammoth Hot Springs and Tower-Roosevelt. The most famous waterfall in Yellowstone National Park is the Lower Yellowstone River Falls with an impressive 308-foot drop. The Upper and Lower Yellowstone River Falls are popular tourist attractions in Yellowstone—for good reason. Just off the main highway between North Rim Drive and South Rim Drive in the Canyon Area, the Brink of the Upper Falls is a dramatic drop of 109 feet into the storied Grand Canyon of the Yellowstone. The Upper Falls often sees less traffic than the bustling Lower Falls, and it is accessible via several roadside viewpoints. The most famous waterfall in Yellowstone National Park, the Lower Yellowstone River Falls are an impressive 308-foot drop with several postcard-worthy vantage points. The viewing platforms are almost always busy, so plan for crowds. A favorite spot is Artist’s Point, which offers a classic view of the falls without a hike. This is a must-see waterfall for anyone traveling through Yellowstone. 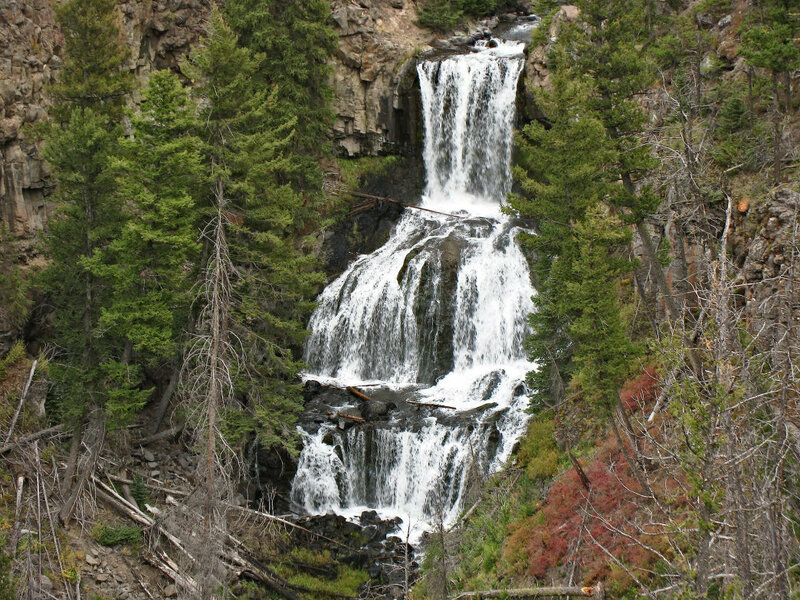 Many of Yellowstone’s falls are best accessed from the park’s entrance at West Yellowstone. Wherever your waterfall-chasing takes you along Yellowstone roads, plan to start your day early to beat the crowds. Remember that while many falls are accessible without a hike, sometimes the extra effort is worth it to leave the crowds behind and get a more personal view. In Yellowstone, you never know what you’ll find along the trail.